Are the Tools You Use to Help English-Language Learners Measuring Up? English Language Learners (ELLs) are the fastest-growing segment of the school-aged population in the U.S. educational system, with many schools needing instructional support to meet the needs of these learners. In places that don’t have large numbers of ELLs and programs to support that population, one could argue it’s even more critical to prepare educators in specializing or modifying instruction to support English learners as they not only learn academic content, but also develop key language acquisition skills. A recent analysis by Taylor & Francis Online suggests that even academic content tests are linguistically complex, using words likely unknown by an ELL. That’s why testing poses unique challenges for this student population. Tailored tools and options for ELLs to allow educators to take a targeted approach and individually connect with each student in order to address their unique needs for instruction. Research in the field of language acquisition suggests that using multiple media to provide visual aids, providing repetition along with additional practice, and highlighting and teaching key vocabulary words are some of the methods that have shown to be effective for enhancing instruction for ELLs. Instruction becomes even more powerful when educators have access to data, which drives instruction and adaptive standards-based practice, in order to target the needs of ELLs. Developing oral language skills is critical for the development of literacy skills. In listening to language used in speaking, ELLs use context to figure out what words mean and learn about sentence structure and word order. Oral language and listening skills are a critical step in accessing written language. Educators can encourage this using prompts such as “turn and talk” and pairing students to discuss reading passages or verbalize how they worked through a problem. Academic language differs from conversational English in that it is more complex and it is not typically encountered in everyday settings. Effective teaching includes planned speaking practice so that students have both formal and informal practice using academic English. Students may struggle to use linking words and phrases such as “because,” “therefore,” and “for example” to connect opinions to reasons. Remind students that linking words and phrases help them connect ideas and sentences, which allows readers to follow what they are trying to say or write. When teaching math, use visual aids. For example, to show examples of fractions, divide a whole circle into equal parts. Develop writing skills by allowing students to jot down notes before beginning formal writing. In this way, students can build from writing fragments to forming sentences, constructing paragraphs, and finally to writing full essays. Seeing growth and improvement can be a huge motivator for an ELL student. But educators won’t know if growth is taking place if it’s not measured. Regular student benchmarking can show not only what they’ve learned, but give educators the tools to plan future lessons. Utilizing portfolios to show writing progress over time can also be a great motivator. In addition, ELLs need support to prepare for and thrive during high-stakes testing. The Measuring Up suite of print and digital solutions prepares all students for their state assessments, and further supports educators with teaching tips and guidance for ELL in the state-specific instructional worktexts. Mastery Education, the creators of Measuring Up, constantly strives to provide richer and deeper learning experiences to prepare students of all backgrounds, including ELLs, for the challenges of mastering today’s standards and unlocking all the possibilities of a brilliant future. Choose a partner that evolves with the ever-changing education landscape. To learn more, visit MasteryEducation.com today! An exit ticket can be an effective way to determine if students are understanding what they are being taught. They provide immediate feedback, while allowing students to reflect on what they have learned, and challenge them to do more than just memorize and recall. Exit tickets can help teachers evaluate their teaching methodology and approach and determine if students are able to retain the learned information. Exit tickets also aid teachers in pinpointing when and where possible gaps in understanding have occurred so that these areas can be retaught. Make the exit ticket relevant to their lives – if the math lesson is about area, students can measure their own rooms or houses. Have them bring in pictures of their room along with the worked equation. For ELA, have them write a story about something related to the lesson that is meaningful to them. 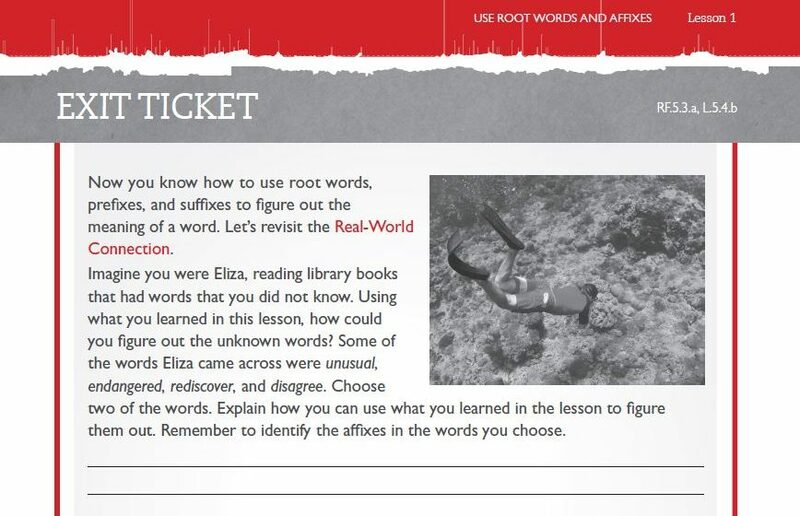 Tying in real-world scenarios and helping students make connections from the lesson to their lives is critical to deepen understanding. Most students are active on various social media platforms such as Twitter, Instagram, and/or Facebook. If you school infrastructure allows for social media access, tweet questions and have students respond on Twitter, or post graphics on Instagram or Facebook and ask for comments to answer. Challenge students to create a rap about the day’s lesson with extra credit earned for a performance! Variations can include haikus and short poems. Students can craft a movie title and description based on the lesson, and then create a marquee poster for their film! Maybe provide your students with some popcorn too as an incentive. Students can create a postcard inspired by the topic. They can write about what they learned, or even ask questions. Make a mailbox for them to “mail” the postcards as they exit the classroom. Measuring Up is a state-customized blended solution that offers standards-based print instruction as well as a digital component that delivers diagnostic/formative assessment and adaptive practice. The lesson format from the Measuring Up print instructional worktexts easily allows the teacher to introduce, review and practice on a targeted standard. The lesson activities can be used as exit tickets. The digital component also provides another way to create exit tickets easy and quickly for teachers. We believe exit tickets are just one more way to prepare students for the rigors of high-stakes assessments and provide educators with the tools they need to measure understanding and target remediation where necessary. For additional ideas, we love those suggested at Edutopia, and encourage you to develop your own too. Let us know what has worked for you here on our blog. 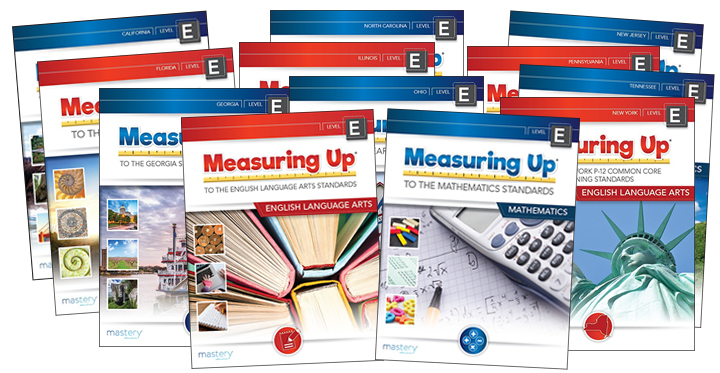 To learn more about Measuring Up and how it helps students build standards mastery, visit us at masteryeducation.com today!